A lot of chess tournaments were held over Labor Day weekend, in places such as New York, Illinois, Florida, and even Lloydminster, Canada. My roommate, as well as fellow US Chess League Manhattan Applesauce teammate Dima Shneider hadn't taken a vacation in a while, and wanted a long relaxing weekend more than anything. 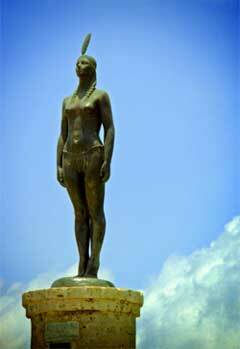 We ultimately decided to go to Colombia, the country. I naturally had the usual stereotype of the country that it was drug infested and very dangerous. Upon doing further research, that couldn't be farther from the truth. While drugs were omnipresent throughout Colombia in the 80's and 90's, the government stepped in and as a result, drugs haven't been as big of a problem recently. I went to Brazil in 2009 with Dima and our other roommate/Applesauce teammate Andrei Zaremba and fell in love with South American culture. The people in Brazil were so friendly, the food was amazing and I was itching to go back to that region, so naturally I started doing research on every country in South America, and decided that Colombia would be the best option. 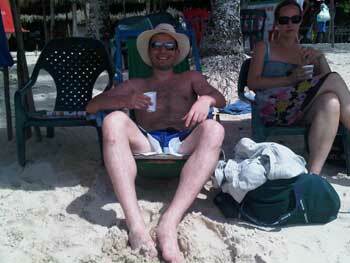 My only requisite for going to Colombia was that we would choose a fairly big city that was known for its beaches. 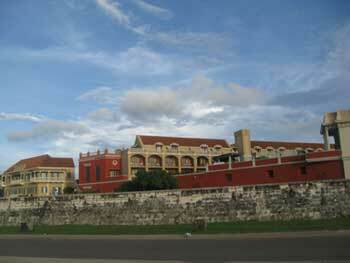 That led us to Cartagena, which is on the northwestern coast of the country with absolutely beautiful beaches. Still, I was in disbelief after I booked the airfare and asked myself if I was really going to Colombia. When I told my friends that I was going, they thought I was nuts. Why would I ever go to Colombia? Apparently I was not the only loco one. 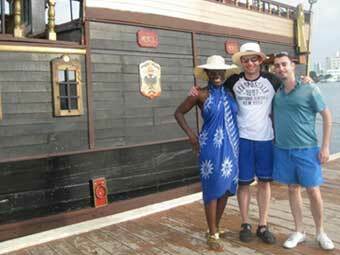 Our mutual friend Yvette decided to tag along for the adventure and away we went! After getting back from a wonderful day of snorkeling and lounging at the beach, we were true gentlemen and walked our new friend Arianne, who we met on our aforementioned snorkeling & beach excursion, back to her hostel. Her hostel happened to be right next to a bar, and at that bar we saw two locals playing chess! 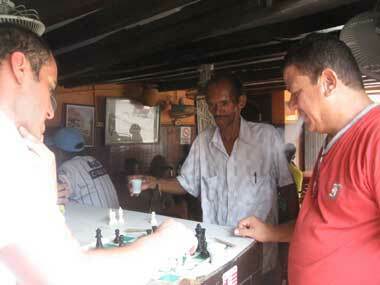 I did a double take because seeing chess players in Cartagena was about the last thing I expected to see. Dima and I walked over to the players and asked if either of us could play next as they were in the middle of a game. They were playing for 1000 Colombian pesos per game (which is approximately 45 cents), and since they were playing without a clock we figured that the game would take a while. Juan was in shock! He bought both of us a round and challenged Dima to another game. By the time the second game started, there was a huge crowd of locals watching the game. They couldn't comprehend that Juan was losing as he was clearly one of the best players in the area. A couple of games later, I switched places with Dima after a few more games and won as well. 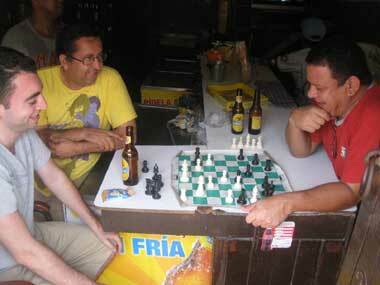 They were astonished that a couple of "Gringos" could come into their local bar and defeat them in chess! The best part of this entire experience was talking to the locals in between games. I have no Spanish speaking skills and was trying to get by with Italian, which is average at best while the locals didn't speak much English. Dima and Yvette were the unofficial translators for our trip. Luckily I was able to understand most of what they were saying to me because Italian and Spanish are so similar, but speaking Spanish proved to be very difficult. I found it so fascinating that people from different parts of the world who can't have more than a simple conversation with each other can connect through a game like chess. Chess is like a Rosetta Stone in this regard, and I definitely look at chess differently now than I did before. When we came back the next day, they called us Bobby Fischer and Garry Kasparov and challenged us to some games again. This time, I insisted on buying rounds for everyone as they had treated us so well the day before. The owner of the bar even gave us a couple of CD's as a gift. A new player joined in the fracas this time, and he ended up being one of the nicest people that we met all trip. 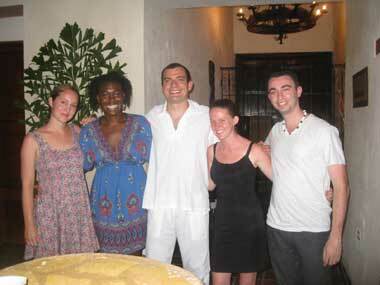 Andres is a lawyer in Cartagena who is an avid chess player, I would say that he was maybe 1600 strength. He happened to speak a bit of English which made it easier for us to get to know him. He provided us with one of the funnier moments of our trip. His wife had unfortunately left him earlier that day, but he didn't seem as upset about it as I would've expected. His philosophy was that if one woman leaves, there are seven more ladies anxious to become queens. Dima playing against Andres. A lot of Aguillas! 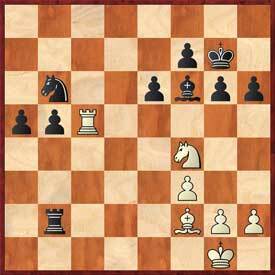 That’s me playing against Juan, with Andres kibitzing. After playing there for a few hours and watching the beers pile up, we decide to make our way to the Gestiami area of the city and spent the night listening and dancing to live Cuban music, which was a very unique experience. Dressed to the nines before our big night out! The rest of the time that we were there we just walked around the city and found random things to do, like going to a mud volcano which was a blast, and haggling for souvenirs. We also bought coffee from street vendors that was absolutely delicious! If you're looking for a nice, relaxing and very affordable beach vacation, I would definitely look into going to Cartagena, Colombia! Please say hi to our new friends from us if you're ever in the area, they know us as Kasparov and Fischer!